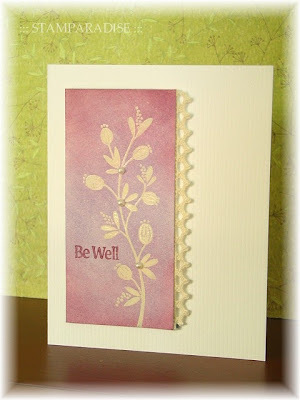 I made this card for this weeks Mercy's Tuesday Sketch Challenge (MTSC 58). I followed the sketch strictly except that I rotated it. I'm getting crazy about stripes and polka dots now. The people who will visit the group exhibition in Macau may see a lot of striped or polka-dotted stamps. lol! 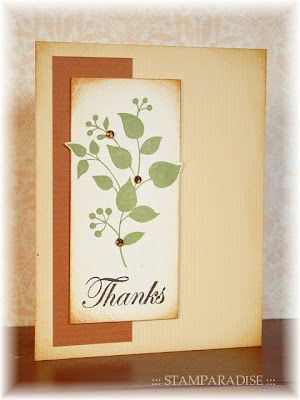 This card was used the sketch from Clean & Simple stamping, FTL #74. 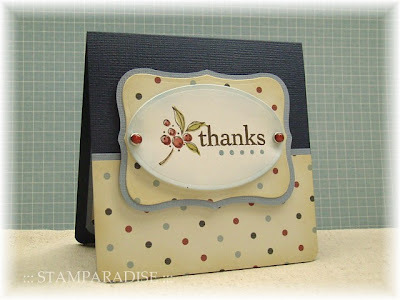 I stamped the image with Versa Mark Ink, and heat embossed with clear EP. 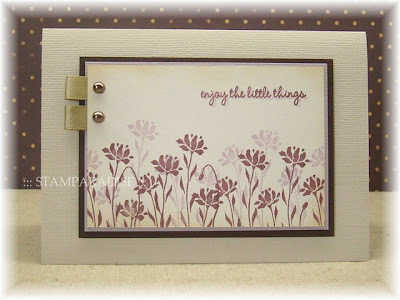 After that, I sponged the background with Wisteria and Burgundy Inks (Versa Craft). 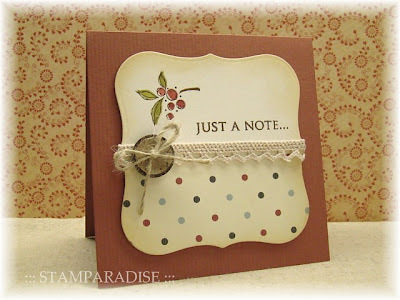 I added some lace and a couple of pearls to finish the card. This is the second card I made from the same layout. But I added an extra layer behind the focal panel. I stamped the image and the sentiment, and cut it out. All the edges around were slightly sponged with Antique Linen and Vintage Photo inks. To finish the card, I added a couple of rhinestones. I have to concentrate on the preparation for the group exhibition now. So I may write this blog about once a week. I hope you don't forget me ~!! Thank you for stopping by today. Have a nice day! This is the second post for today. Please scroll down to see the first post. I'm thinking about what is clean and simple card, and what kind of stamp match with it. I had thouhgt that the CAS card was easy one, but I noticed that it was wrong. It is pretty difficult!!! Maki said that the CAS cards were difficult to make due to the blank. And Koyagi said that we should do "subtraction" to keep a creation simple. I think it is difficult to understand perfectly what they said, but they are right. I would like to learn more about the CAS cards. The photo is the card I made yesterday. Would you call it a CAS card?? I'm so excited today because it is the day that my exhibition in Hong Kong starts!! I hope a lot of people visit there and enjoy it. Well, I have an announcement about another exhibition that I'm going to join in. 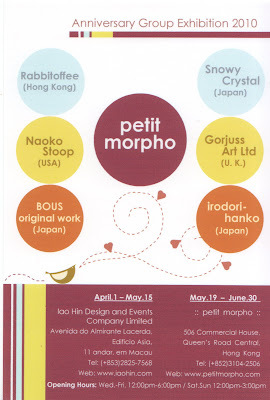 "petit morpho" is going to hold an anniversary group exhibition in Macao and hong Kong from April to June. Six artists will participate, and three of them are Japanese artists of the hand-carved stamps. Then, Gorjuss Art Ltd which you know in Gorjuss girl is going to perticipate! How gorgeous, isn't it? I wish I should have been able to visit there as one of the spectators. lol! Please visit the artist's web sites to know about them more! I've not decided the theme for this exhibition yet!!! I'm thinking about it for these days, but no good idea is appearing in my mind. The only thing I've decided is to design and to carve a lot of stamps... grrrr! I must hurry up! Sorry...The card I'm showing you today is not a simple & clean one. Don't ask me where my New Year determination has gone to. lol! 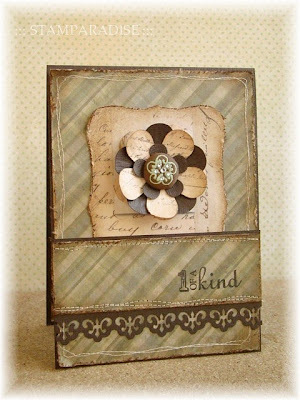 This weeks theme at Creative Card Crew is distressing. Wow! I thought that it was good opportunity to use my poor paper distresser which had been neglected since I purchased a few month ago. The paper distresser is an exciting tool, isn't it? I have been absorbed in it! The sketch I used is from Mercy's Tuesday Sketch Challenge(MTSC55). I rotated it. The focal flowers were punched out with Retro Flower punch(EK Success), and were slightly sponged with Vintage Photo Ink(Distress Ink). Paper: Bazzill, MME, K & Co. In Japan, it is said that New Year's Day is the key of the year. We establish the aim of the year at the beginning of a year and make an effort to achieve it. 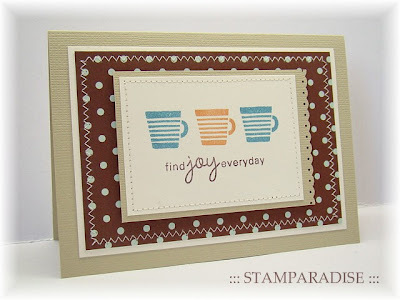 When I had finished this card, I wanted to combine this polka dot DP which is from Kaiser Craft with red card stock. On this card, I used only one layer! But I could not resist using some lace and a button. lol! But I think it is a quite simple card, and I'm very satisfied with it. I'm entering these cards to these challenges. Crazy 4 Challenges --- Polka Dot Fun!